This is the second in a series of What’s Next Blog posts examining how many of the Fortune 50 have really evolved past the toe-in-the-water social media experimentation phase, and how many are still in the head-in-the-sand era. A What’s Next Blog study of the Facebook presence of Fortune 50 brands reveals the bad news that there is some serious potential for reputation management issues. The worse news: those issues were avoidable. 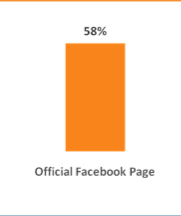 Fifty eight percent (29) of the Fortune 50 have an official Facebook page. Forty-two percent (21) of the Fortune 50 have at least one unclaimed Facebook Community Page – sometimes in addition to their official Facebook pages, and sometimes as their only representation on Facebook. Facebook Community Pages are created by Facebook, using Wikipedia information about the company. Anyone can add information, spam, or photos to the Community Pages, and there’s currently not a damn thing a company can do about any of the content. From November 2010, until approximately the beginning of January 2011, Facebook allowed companies to claim up to five community pages and merge them into their official Facebook page. And then, in typical Facebook fashion, that opportunity disappeared without an announcement. As has happened many times before, Facebook quietly and capriciously changed its rules, leaving companies with no way to control what is said on Community Pages, That leaves you with nowhere to turn if you’re a corporation with a Community Page that’s hurting – or has the potential to hurt – the company. I warned companies (as did others who advise companies on social media) that Community Pages on Facebook are a reputation management nightmare waiting to happen, and urged them to claim their Community Pages while the claiming was good. That time has passed. And I can’t help but wonder why any company in the Fortune 50 could have missed that window of opportunity. o Archer Daniels Midland has no official Facebook page, but a Community Page has 818 fans. o Valero Energy Community Page: lack of control could become a huge issue in the event of an oil spill or ethanol crisis. 46,040 likes, but NO information about the company on the Info page and a bunch of spam among the posts on their wall. o Wellpoint has an official FB page with 218 likes and a Community Page with 517 Likes and no wall posts. Implications for brands: It’s only a matter of time until a brand hijack on a Facebook Community Page becomes a major wake-up call. Dear Fortune 50 CMOs: if your agency didn’t insist you claim your Facebook Community Pages while you have the chance, now’s a good time to ask them why. – Barry Silverstein: Are the Best Global Brands Also Tops on Facebook? – Amy Porterfield, Social Media Examiner: Top 10 Facebook pages and why they’re successful.